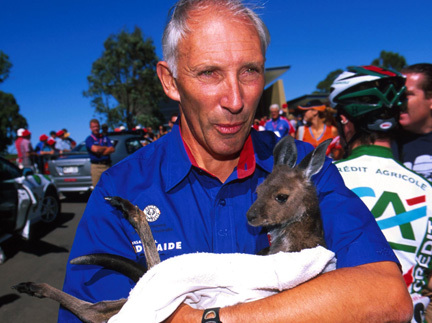 Pedalling Squares: Is there no end to Phil Liggett's talent? Ever since I first saw The Atomic Cafe I've been a fan of "found art", and one of my Christmas presents this year was a collection of "found poetry" called Dancing on the Pedals. It was compiled by Doug Donaldson, a former contributor to Bicycling, and contains gems drawn from the commentary of 'Uncle' Phil Liggett. The tall, tanned one is Phil Liggett. The short, hoppy one is not Paul Sherwen. by helpers from their team cars. and get ready for the long flight down. No parachutes will be issued. in the Tour De France today. Calling it poetry is slightly tongue in cheek, of course, but funnily enough, it does neatly satisfy two of my admittedly uninformed criteria for good poetry: it's far more expressive than its minimal word count would lead you to expect, and it provokes an emotional response. this little group are still in the lead. The crowds out on the side of the road cheering them all the way to the finish. Urging on the various people they want to win this. Is it going to be a win for France? at least as far as the weather is concerned. The storm is all down there. Anyway, you can get the book here. In the meantime, what are the chances of getting Phil Liggett added to the GCSE syllabus?